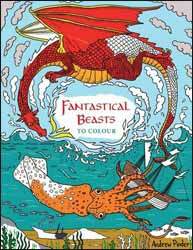 Fantastical Beasts to Colour is a colouring book aimed at the young to teens market which not only offers up illustrations to paint/colour in, but also provides information on each creature. And, because some of them are quite a mouthful, even details how to pronounce theme. This element of the book is just as important as the actual pictures, as it's no fun, as a parent, having to explain to your offspring what they're colouring if you yourself have no idea. Obviously it's a bit of a cheeky cash-in on Fantastic Beasts and Where to Find Them, but it has nothing to do with that franchise. This is simply a collection of creatures of myth and folklore. The illustrations are cartoon like in style - the sort of drawings you'd expect to find in a children's story book - but they work well here. You can always pick it up, have a flick through, and decide for yourself whether this is a book that you'd get a great deal of pleasure out of colouring.